Editor’s Note: This blog was originally published on May 15, 2015, and has been updated for relevancy. Now that you have gotten estimates and found the right contractor, it’s time to pick the color of your shingles. Does it really matter what color you pick? Yes, it does and here are some reasons why. The first thing people see is the exterior of your home. You want it to look nice. The roof is a dominant feature of your home and can be seen from the street as well as your neighbors’ homes. You are going to have to live with the color of your shingles for many years to come, so it is important that you put some thought into what you would like. What Climate Do You Reside In? The type of climate you are in could potentially affect the shingle color you choose. If you live in a climate that is typically warm and sunny, you may want to go with a lighter shingle. Lighter shingles tend to reflect the sun while darker shingles soak up the sun’s rays. If you live in a colder climate, a darker shingle will help to keep some of the warmth inside your home and assist with melting snow and ice off of your roof in the winter. Although shingle color will help in different ways, the climate alone should not be the determining factor of the color you choose. Keep in mind that the roof will absorb heat no matter what color shingles you choose and transfer that heat downward into the house. The main difference in the color you choose will be that darker colors will absorb the heat earlier in the day and later in the afternoon than lighter ones. If you are planning on selling your home, curb appeal adds value to your home and your roof is a great way to maximize curb appeal. Try to choose a color that will work well with the color of your home and compliment it versus standing out. You probably do not want to put a reddish tone roof on your yellow home. While you may like it, your neighbors may think it’s an eyesore and potential buyers may be turned off. Look around at the other roofs in your neighborhood for inspiration on which colors work better in your area. Also, keep in mind that shingle color can create important visual effects. Darker colored shingles may help a steep roof look less towering and lighter colored shingles may help a home to appear taller or add a sense of airiness. Remember that a strong, quality, visually appealing roof can add value to your home. Another consideration when choosing a color is your landscape. Do you have trees hanging over your house? Are you in an area where the weather changes frequently? Undoubtedly, a lighter shingle will show wear quicker than a darker one in terms of dirt and grime. The color of your shingles is a surprisingly important decision to make when having your roof replaced. Color can have a direct impact on your home’s looks and value, and can even affect how much energy you will need to use to keep your home temperate. Are you looking to have your roof replaced? Need some advice on how to choose a shingle color? Contact On Top Roofing. 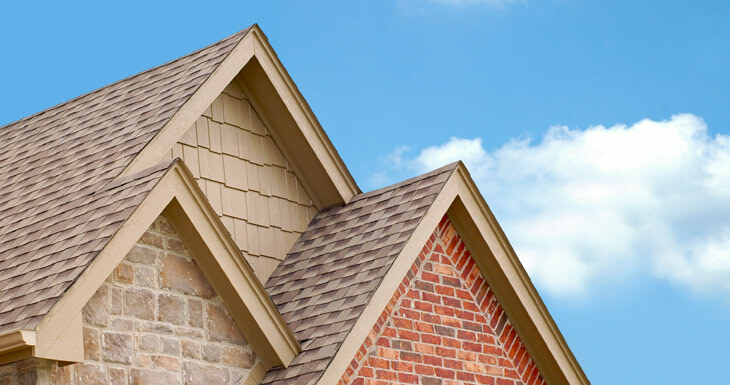 Our team of roofing experts will be happy to work with you to choose the perfect color.